The fact is that Waisai City is the capital of Raja Ampat Regency. Due to its fame, it attracts many tourists over time. Not to mention it is a significant checkpoint for those who want to reach other parts of Raja Ampat. Thanks to Marinda Airport and Waisai Port. So, what can people do in Waisai? That’s the question. Most parts of the city are land and some of them are hills. Still, tourists can also find some beautiful beaches there, including WTC (Waisai Torang Cinta). Some parts of Waisai City are dominated by forests and bushes. When it comes to the city’s administration, it is located in the midst of it. In the same location, there is an open space, a field, office complex, etc. The city also features a port and airport, which become the primary transportation checkpoints there. When it is about the beach, the water is calm and it features good facilities, as well. The landscape is superb, either. With all these features, all tourists would have a good time in Waisai City regardless of their motives to come to the location. Waisai City is located in Waigo Island. Being a famous city in Raja Ampat, it has attracted lots of tourists as the time goes by. These people come with a different purpose and some of them want to learn the culture of the city. The fact is that Waisai consists of numerous types of tribes. Most of the people living in Waisai are incomers. They come from Java, Maluku, and other regions. Still, the indigenous people also live there, especially in the villages near to the sea. Due to this mixed cultures, Waisai City becomes more attractive in the eyes of tourists. Tourists are also impressed by the facilities of the city, which are quite helpful for them. That means visitors won’t get any problems when looking for eateries, accommodations, and other types of facilities. What about tourist spots? As mentioned before, it is famous for stunning beaches. 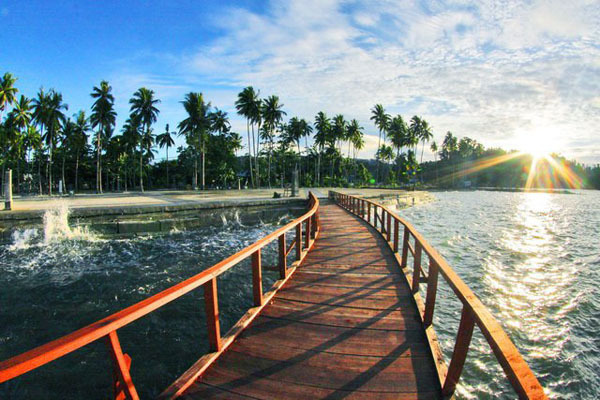 There are two best spots to visit, which are Waisai Torang Cinta and Saleo Beach. Both of them have a distinct beauty, so they are worth a visit. In some occasions, tourists can enjoy ceremonial events in Waiasi City. The thing is they need to learn the schedule first. Next, it is a fun activity called birdwatching. The location is in a nearby hill, on which tourists can climb and explore. On top of the hill, some local birds live there. There is even a chance to encounter birds of paradise. Also, don’t forget to try some local foods in nearby eateries like Sate Ulat Sagu!